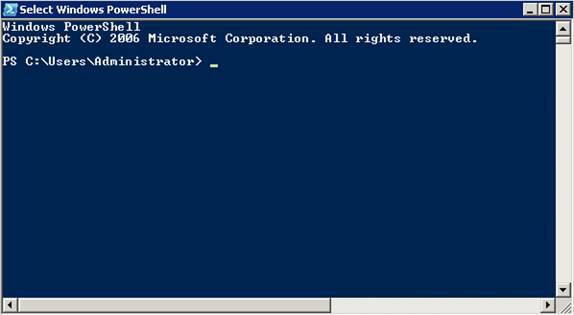 In order to manage Hyper-V from the command line, you will need Powershell. You can install it both on your Hyper-V server (to start testing on the local machine) and on your local PC (so that you can run Powershell commands to the server remotely). In my case, I just installed it on the server as that is where I will be demonstrating the Hyper-V Powershell commands. 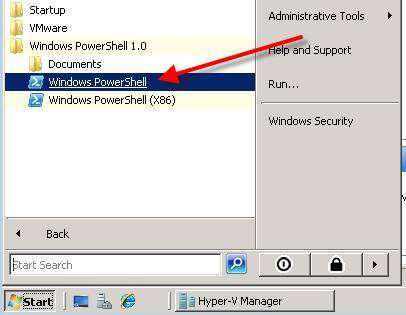 To install Powershell in Windows 2008, go to Server Manager, then to Features. Click Add Features. Check the Windows Powershell box and click Next. Now, click Install to actually install it. When done, you should see Installation Succeeded and you can click Close. Now when you go to Start – All Programs, you should see Windows Powershell and you can click on Windows Powershell underneath that. Before you actually move on to running commands, there is something else that you really want to get – the Hyper-V Powershell Library. James O’Neill is the developer of the Powershell management library for Hyper-V and his library is invaluable when it comes to administering Hyper-V from the command line. To download and install it, go to the Powershell management library website above and get the Hyperv.zip file. It contains 2 files inside. Extract these to a simple directory you can get to easily at the command line, like C:\temp or make a directory like C:\powershell. Now, Start PowerShell. Change directory into the directory with the Hyper-V PowerShell Library scripts. Notice the “dot” then “space” and then the full path to the Hyper-V PS1 file. That “dot space” is very important because that is what keeps this library in memory for the duration of this PowerShell session. From here, you will be given a security warning an you must choose “R” to run this script. 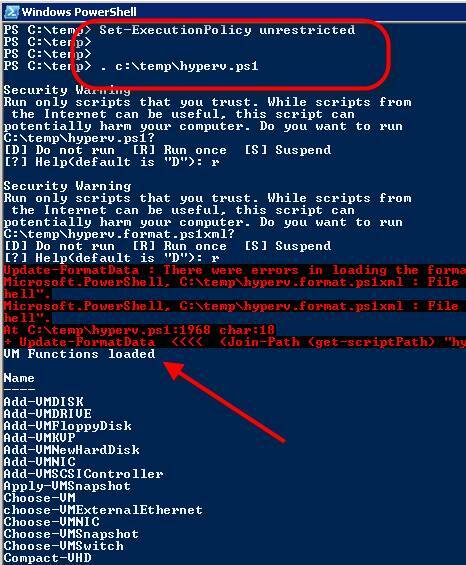 You should be rewarded with “VM Functions Loaded” and a list of all the commands that you are now enabled to run so that you can manage your Hyper-V Server from the PowerShell command line. Now that our library is installed, let us find out how to use it. The Hyper-V PowerShell Library User Guide explains how to use the, almost 100, commands included in the library. And remember that each of these almost 100 commands has many parameters. Thus, this is a huge management library for Hyper-V, not just a handful of commands. Explaining how to all the commands goes beyond the scope of this article (and that is why there is a 41 page user guide). 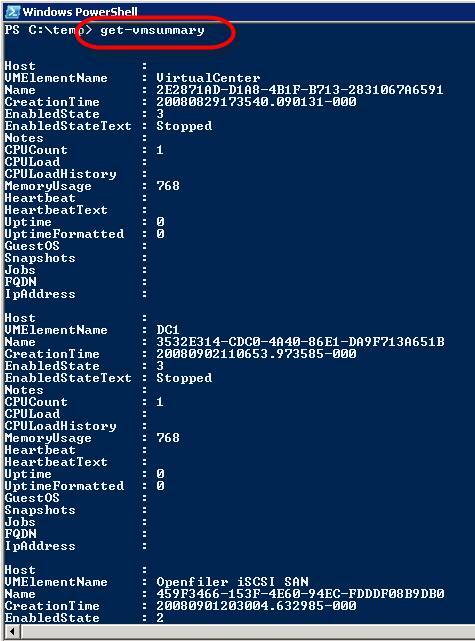 That being said, let me show you how to use a handful of the basic commands in the Hyper-V PowerShell Library. And keep in mind that, just with any commands you can perform at the command line, they become exponentially more powerful when combined with scripts that can use them intelligently. Start-VM, Stop-VM, Suspend-VM, and Shutdown-VM – the purpose of these commands are obvious. All you need to provide is the VMElementName as it was shown in Figure 6. 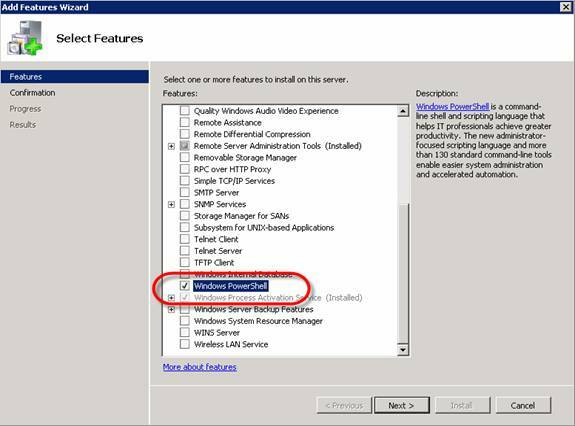 New-VM – what is the quickest way to create a new guest VM? Just type New-VM and here is what you get, a new virtual machine that you still need to configure and start. Get-VMmemory – lists out all virtual machines on the host and their memory amount. The Get-VMsnapshot command shows all snapshots created in your Hyper-V environment. When it comes to snapshots, you can also use commands like Update-VMsnapshot, New-VMsnapshot, Apply-VMsnapshot, Get-VMsnapshotTree, and Choose-VMsnapshot.